Why do we argue, when we could be discussing things in a productive manner? Arguments often occur because the parties involved simply don’t have the tools to transmit their ideas clearly. In this kind of situation, the whole conversation can completely break down. 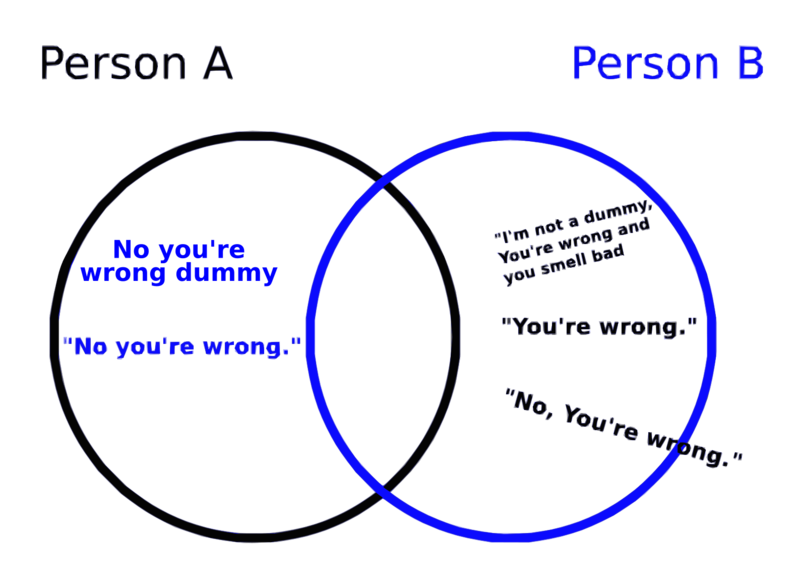 It’s easy to spend a lot of time saying “You’re wrong”, without accomplishing anything. 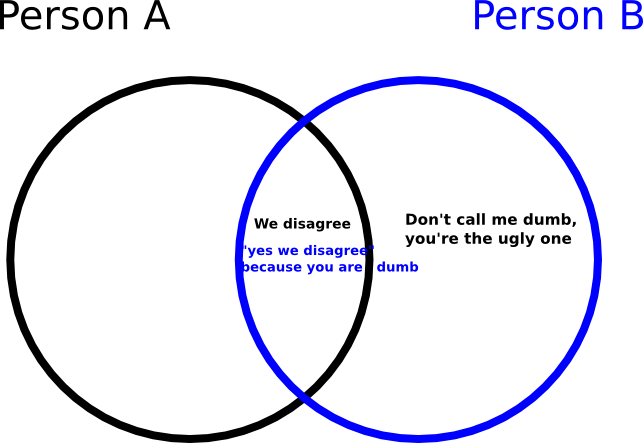 Let’s imagine two people having an argument, represented by a Venn diagram. 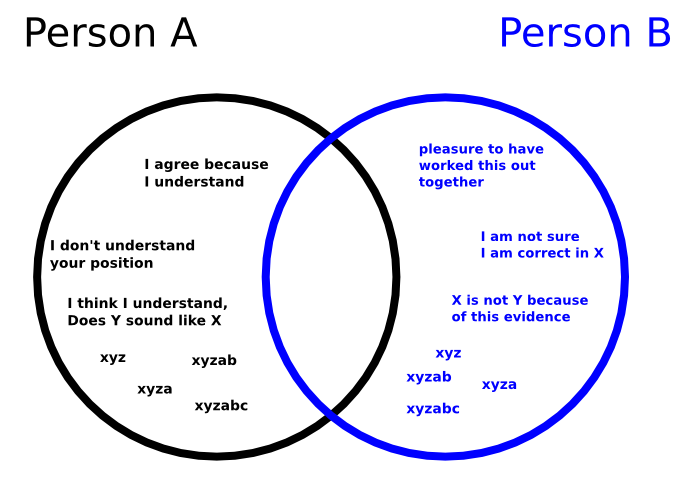 A in the black, and B in the blue. They each see the issue slightly differently. 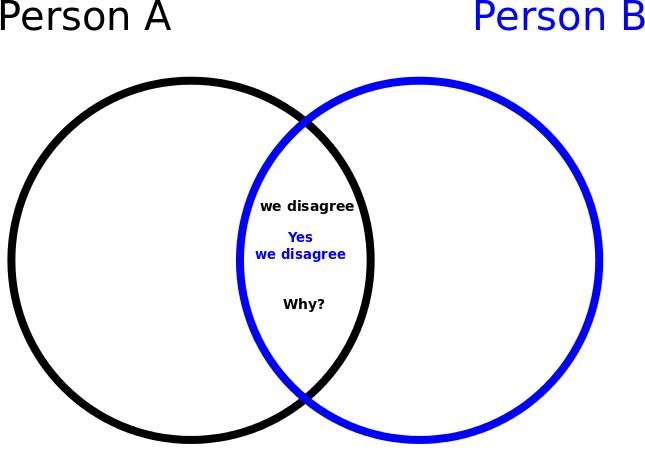 The blue circle to represent B’s opinion and a black circle to represent A’s opinion. 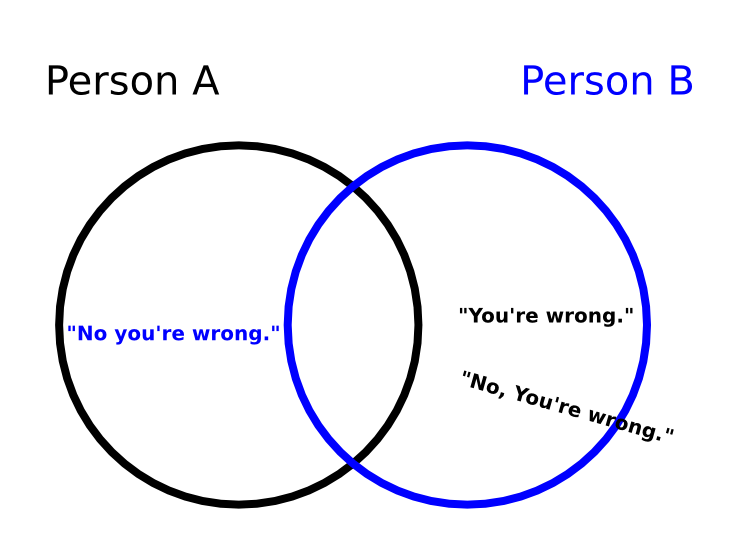 The concept of “You’re wrong” falls into the area of describing the other person’s ideas. 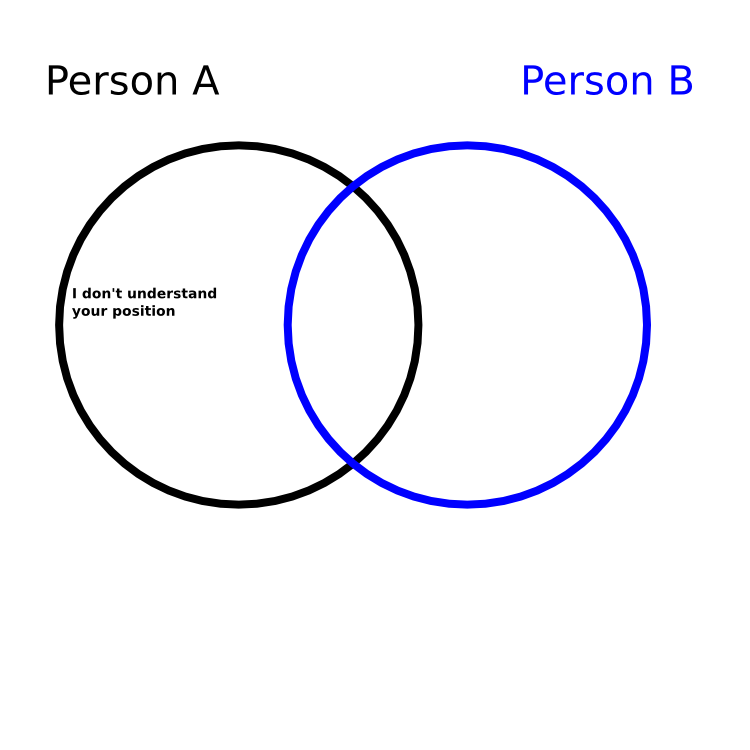 Person A says, “You’re wrong” to Person B. A description of the state of affairs of B’s ideas. Not one that really represents A’s own ideas. 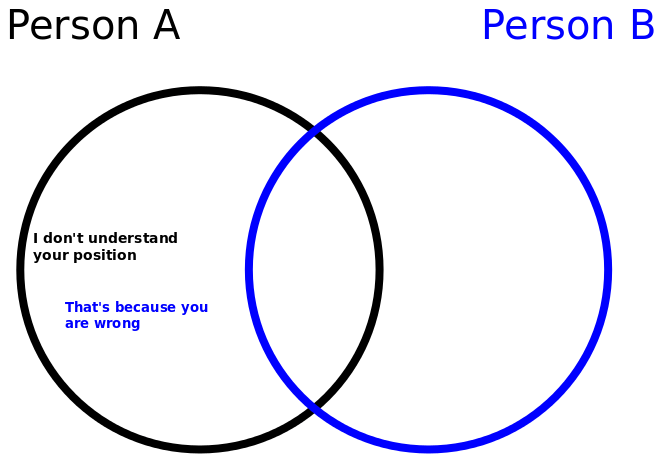 Naturally, Person B says, “No you’re wrong” back, equally making the unfounded claim on A’s conceptual real-estate. 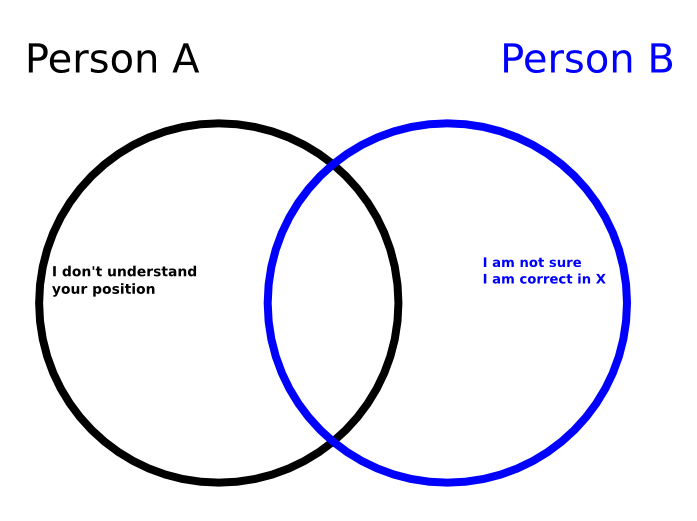 The thing that is hard to demonstrate is the conflict that is accidentally generated by crossing into each other’s territory to declare things. To do this creates a crossing-over of ideas. 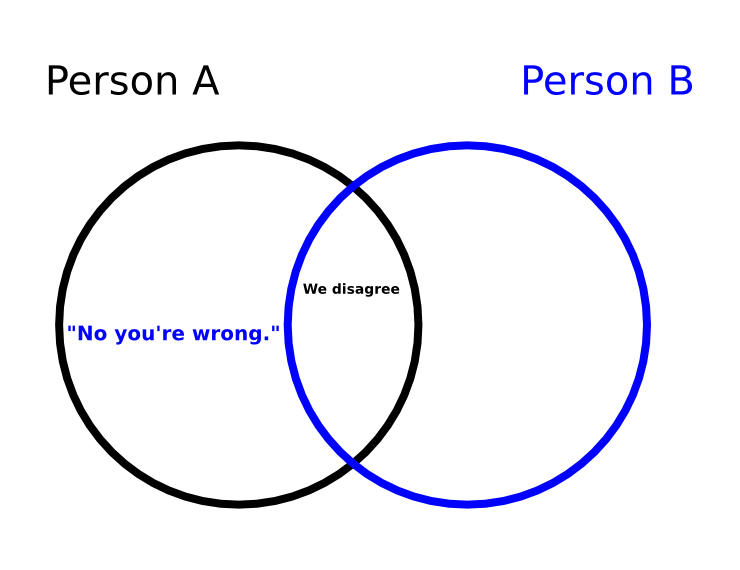 Now suppose instead of Person A saying, “You’re wrong”, where they place the burden of argument (and proof) on the opposition, they now say, “We disagree”. Person B can now continue to make the same argument of “You’re wrong”. 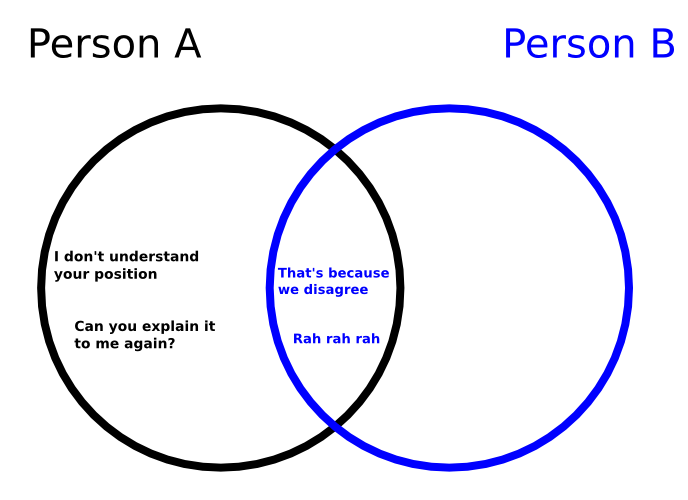 But so long as Person A shrugs and replies “We disagree”, there is no conflict in the argument. 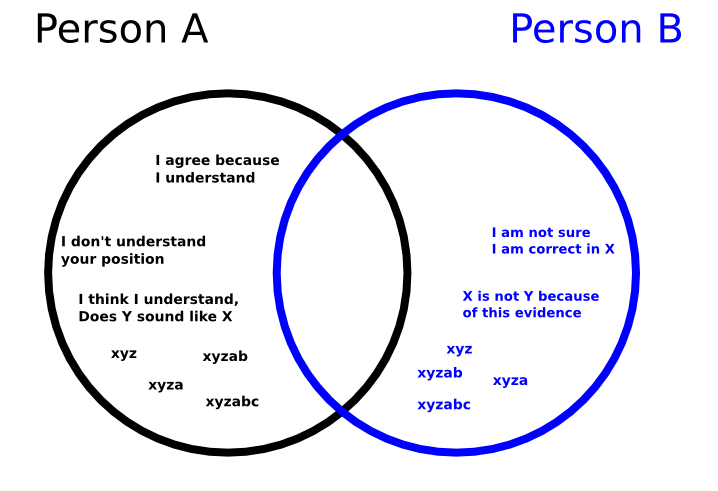 For some Person Bs, Person A might get lucky, and the two could end up with a happy middle ground of “Yes, we disagree”. 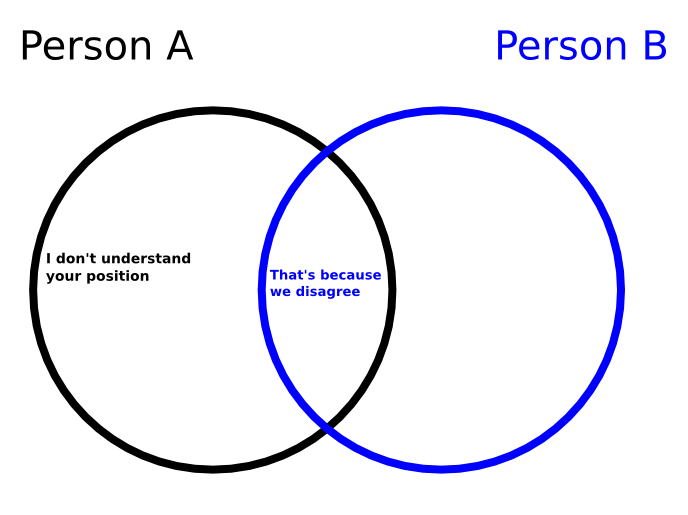 This is already a step in the right direction, and will let the pair continue to sort out precisely where and how they disagree On the other hand, a stubborn Person B will still present a problem. Hey, that’s the internet for you! You win some, you lose some. 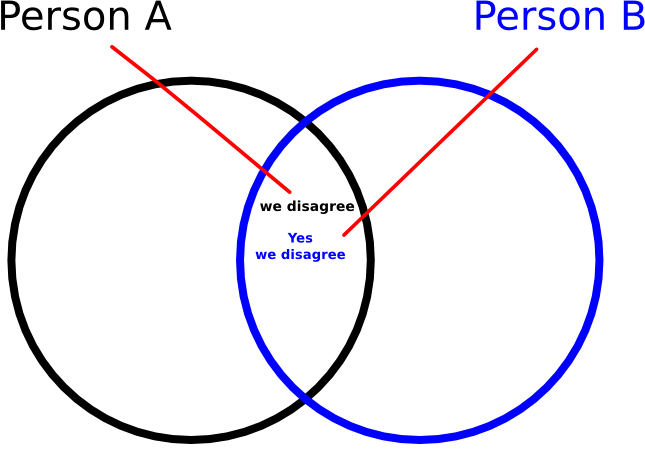 Nonetheless, the shared ground offered by “We disagree” will often spur constructive discussion. As it turns out, there is another way. 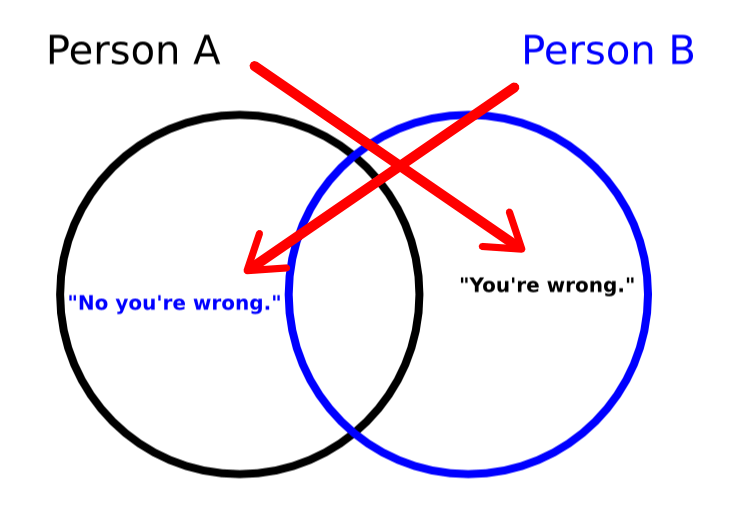 When you go to understand someone else’s idea, instead of starting with “You are wrong”, consider starting with, “I am wrong”. Right from the start, this gives you an advantage. Rather than starting off from a position of conflict, you start off in a position of equality. Sometimes the other party won’t accept your peace offering. They will bristle and rage and prepare for the offensive. And a pleasant discussion can ensue. What we are aiming for is to trade knowledge until we can conclude the answers in the end. This style of measured, polite and constructive conversation can only occur when parties meet each other on equal terms. 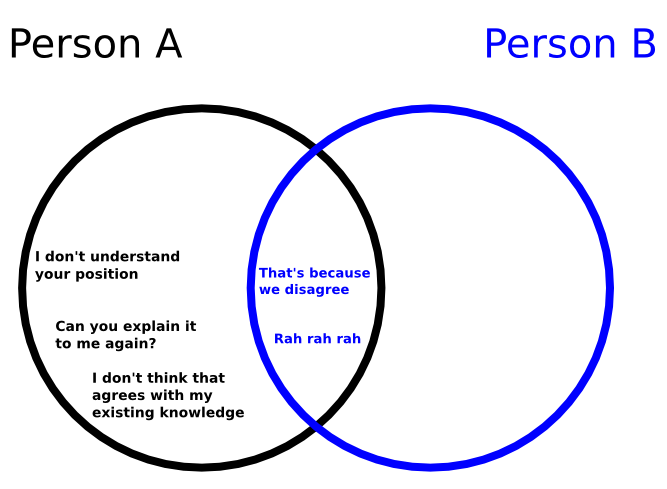 If there’s one lesson to take home from this post, it’s that the way you deliver your argument can easily be what makes it powerful. If you come in throwing punches, ready to take your opponent down a notch or two, you might enjoy yourself – but don’t expect to have a constructive discussion. 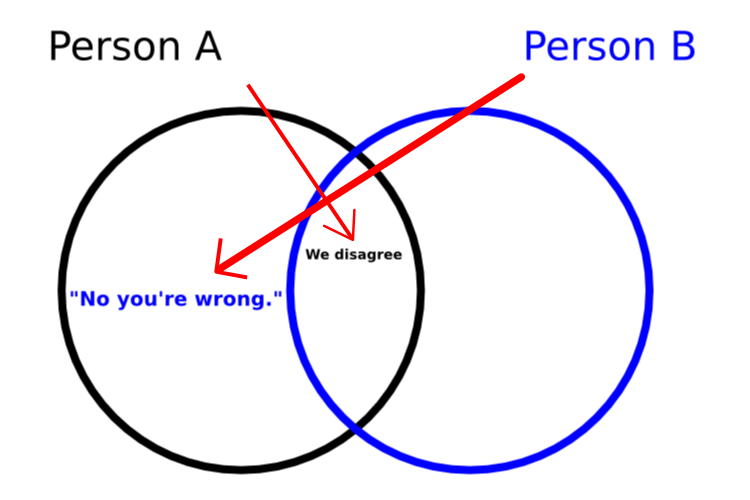 Whereas if you approach your opponent as an equal from the shared ground of “We disagree”, or even from the vulnerable position of “I am wrong” – well, what reasonable opponent could disagree with that? This post took me weeks of thinking about, and only 3 hours to write down and draw the first time. But it was rubbish. Didn’t make sense. The rewrite was contributed by the Captain and the slack, taking another 2 hours. This version gets the point of the idea across. I sent the original post to Tim@waitbutwhy but he is very busy and declined to draw pictures to go along with it. 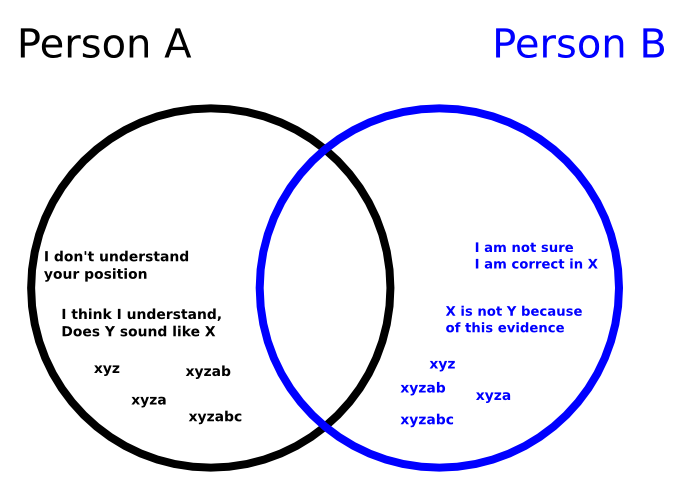 This entry was posted in models of thinking and tagged arguments, constructive, delivery, disagree, discussions, i am wrong, understand, venn diagram, wrong. Bookmark the permalink.